We are excited to have you at this very special event. The Sixth Annual Blue Dress Breakfast will be held on Wednesday, May 1, 2019. We begin at 7:30 a.m. and finish around 8:30 a.m. The minimum donation is $250.00. And if you will pledge $400.00, we have a generous donor who will match your donation at that level. We are again at the Campion Ballroom at Seattle University. Complimentary parking is provided at the Murphy Garage just adjacent to the Campion Ballroom. I am unable to attend, but I want to donate. Click on the orange GIVE TODAY button in the header. 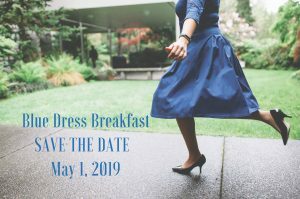 Please let us know the first and last names of guests you are bringing to the Blue Dress Breakfast. Please let us know the first and last name of the table captain who referred you. If you have any comments, please forward them to us.